After posting the news about the predicted fight over the proposed Multi-User Path (or MUP) along Kinnear and Waltham today, it occurred to me that my messages about bike infrastructure aren't entirely coherent at times. So this is an attempt to iron some of those issues out. Obviously, anyone who's read this blog for a while can tell you that I'm against bike lanes and sharrows (bike lanes more than sharrows, but I'm not in favor of either). In my opinion, they make drivers think that "roads are for cars" by seemingly designating where cyclists are "supposed to be" (whereas the intention is quite the opposite). And bike lanes coax riders onto the road with an illusion of safety that simply isn't there. But bike paths... that's a different and interesting monster altogether. So let's define a bike path - or in this case a multi-use path. They're paved paths that are free of motorized vehicles by design. Simply put, that's about all there is to it. And many folks use the paths for transportation, though they most certainly weren't created for that purpose (otherwise, we'd have more east-west routes to go along with the multitude of north-south routes in Columbus). They're designed for recreation right now. 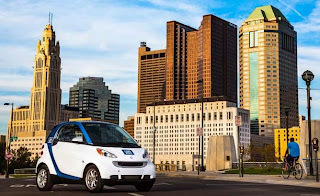 Creating a connector for MUPs, especially between OSU and Upper Arlington, is a great idea. It'll allow people to get around more easily, and those who don't want to ride in the streets for whatever reason can do so. It's another great transportation option. If they're used properly, and that means cyclists not flying out of control, walkers staying to the right, and everyone using them following the rules (no dogs on the paths, etc. ), then they're a great way for people to get around safely and quietly. Quite frankly, I like taking the paths on occasion - it gets me away from the traffic noise and the bubbly seething cauldron of road rage that is rush hour. And they don't lessen the position of cyclists on the streets because they're not part of the streets - they're independent of the streets. So that's my manifesto of bike paths. What's your opinion of them - do they serve us well as commuter cyclists, or should we always stick to the streets? If they actually connected to where I needed to go- and connected to the streets at reasonable intervals, I would LOVE bike paths. And use them lots. I don't share your opinion of bike lanes, though. Bike paths are wonderful, especially when they have few or no intersections with cross-roads. They're like the freeways of the bike world, grade-separated and the safest facility there is per vehicle-mile. They encourage all users, including the women, children, and the elderly that you will never find biking on streets without bike lanes. However, I don't think the planned multi-use path adjacent to Kinnear is actually a multi-use path. When a path is built along-side a roadway, it's a cycle-track, or basically a 10-foot wide sidewalk. These are the same things you said were dangerous here. I would only consider a cycle-track when there are very few cross-streets and bikes can't be accommodated safely on the street. In the case of Kinnear, there aren't many cross streets, but there are a lot of driveways. I am concerned about cars turning into the driveways and not seeing cyclists on the cycle-track. I think paved shoulders would probably be a safer alternative for Kinnear. If the cycle-track goes forward, I suggest consolidating the number of driveways to reduce the number of conflict points and making the path highly visible. Maybe include some speed bumps in the parking lots too near the path. If that's the case about the proposed connector, then I have to agree. I got some different information. I'll have to go back and take a look at this. Thanks for the heads up. I love bike paths. I wish they were built more with transportation in mind. We have a similar problem in Raleigh where the MUPs make an almost complete circle around the city, but only come close to actually going downtown in one location. I've been known to take some crazy, circuitous routes to get downtown on the MUPs, especially when traveling with my wife, who doesn't feel comfortable on busy streets. But I'm not sure that I agree that they don't lessen the position of bicyclists on the streets. I know that it's true legally, but legally the same applies to bike lanes and sharrows. However, I've heard/seen many an irate motorist complain that facilities were put in place for bicycles, and that is where bicycles should ride instead of being on [the car's] roads. Obviously these people think of bicycles as being purely recreational (or don't really think that deeply about it all) because it's easy to point out that there are not MUPs to all destinations and that in many places the MUPs are off limits after dark. But regardless of how insupportable the arguments are, the arguments continue to exist. However, those complaints hinge on the /existance/ of the MUPs, not on any given cyclist's presence/absence on them, so I really don't see that any harm is done to any pro-bicycling cause by using the MUPs when convenient. I certainly use them frequently and often plan trips in terms of where the MUPs will take me. But there's no MUP at my front door, and there's almost never one that goes right to my destination, so every trip on the bike paths also includes some road riding, and always will unless every street gets a corresponding bike path. Rob E. - that's the one downside I see to them. I didn't make that clear - though I think the "bikes belong there" effect is definitely lessened with bike paths versus on-street infrastructure, it's definitely still there. And there are some communities that actually do legislate that if a bike path/lane/sharrow is available that the cyclists MUST use them. We're lucky here, as Ohio has no such law - in fact, Ohio explicitly prohibits any community from making such a law. But obviously, that's not the case everywhere. There's a lot that still needs to be done to lessen the power of cars in our society, top to bottom. In a perfect world (or in the Netherlands http://www.youtube.com/watch?v=n-AbPav5E5M) more people would travel/commute by bike. 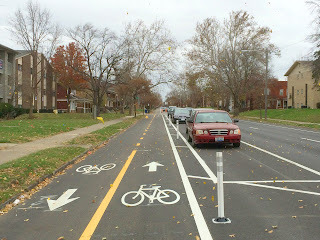 This would make the streets safer and more bike friendly and decrease the need for more bike paths. Cyclists could use the existing pavement to travel without laying more for new bike paths. To me it seems like the increased need for bike paths/lanes represents our society's resistance to bike transportation in general (said the sociology major). I'm basing my cycle-track assumption entirely off of the "constructing a new Multi-Use Path (MUP) for pedestrians and bicyclists along Kinnear and Waltham roads" wording in your link. If you have other details about the path design, then I'd love to see them. The MUPs are great during off hours when they are nearly empty - my morning commute I use the Olentangy path and see maybe 1-2 people per mile. During peak recreation hours they are a zoo. If everyone would follow the rules (stay to the right, single file when other traffic around, dogs walked off the side) there would be a lot less conflict. People complain about cyclists passing too closely, but when they are walking/jogging three wide or right down the centerline wearing headphones so they cant hear the warning/bell we dont have a lot of choice.